This article is a short summary of Mario Sports Superstars. Super Mario Wiki features a more in-depth article. Mario Sports Superstars is a compilation sports game in the Super Mario series, released in March 2017. The game was released alongside a series of Mario Sports Superstars amiibo cards. Copies of the game are also packaged with a single card from the line. The game features five full sports modes: Soccer, Baseball, Tennis, Golf, and Horse Racing. All five of these modes feature both single-player tournaments and multiplayer, either online against friends or against players worldwide or locally. ↑ 1.0 1.1 AusVGClassifications on Twitter (September 4, 2016). Retrieved November 19, 2016. ↑ 2.0 2.1 Nintendo 3DS Direct 2016.9.1 プレゼンテーション映像. Nintendo 公式チャンネル (YouTube; September 1, 2016). Retrieved September 1, 2016. ↑ 3.0 3.1 NoA PR - New Games Starring Mario, Yoshi and Pikmin Coming to Nintendo 3DS in 2017. GoNintendo (January 24, 2017). Retrieved January 24, 2017. ↑ Mario Sports Superstars releasing March 30 in Japan. Nintendo Everything (January 18, 2017). Retrieved January 18, 2017. ↑ Mario Sports Superstars is coming out in Europe on March 10. GoNinendo (January 26, 2017). Retrieved January 26, 2017. ↑ Compete to be the best in Mario Sports Superstars, coming to Nintendo 3DS on March 11th! Nintendo of Australia (January 30, 2017). Retrieved February 24, 2017. ↑ 한국닌텐도, New 닌텐도 2DS XL 발매 및 본체와 동시에 발매되는 닌텐도 3DS 소프트웨어 발표. Nintendo.co.kr (May 26, 2017). Retrieved May 31, 2017. 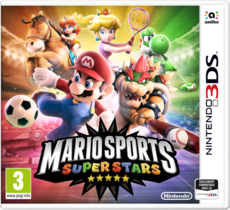 ↑ 8.0 8.1 Mario Sports Superstars on the European Nintendo website. Retrieved September 1, 2016. ↑ Nintendo 3DS Direct 9.1.2016. Nintendo (YouTube; September 1, 2016). Retrieved September 1, 2016. Game & Watch: Mario Bros. • Super Mario Bros.
Donkey Kong (Classic NES Series • G&W • GB) • Donkey Kong Jr. This page was last edited on 12 July 2017, at 02:58.